The diagram below depicts the measurement of each height datum together with its abbreviation. TVDSS is True Vertical Depth SS. This is measured from mean sea level (MSL). It does not reference KB. Kelly Bushing (KB) is the height of the Derek (drill rig) measured from the MSL. The interpreter should manually enter the KB height under the well info tab (see Creating a New Well). 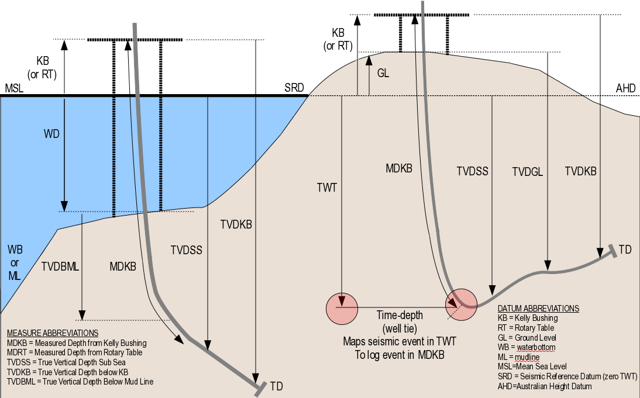 The KB information is also stored when MDKB or TVDKB is entered in at a well (usually in the well Path/Deviation). In these instances, the KB will be checked against the KB in the well info to ensure they match. If they do not, the user will be given a warning. Next: Why can't I see my well in section views?